Pepper Pickled Radishes | ReLocavore: Redefining "local"
I like to pickle – to preserve vegetables in a salt and vinegar brine. I pickle for three reasons: First, it’s a way to preserve some veg to eat later in the season. Second, I have a bad salt-sour tooth (like a sweet tooth, but more for salty and sour things). Third, my pickles never turn out the same way twice, so it’s always a surprise when I open a jar. Sidenote: pickling is not fermenting… They’re different processes. Pickling is killing microbes and reducing their ability to reproduce by introducing a hot, salty and acidic environment. Fermenting is using the microbes to create a warm and slightly acidic environment that both slows reproduction and breaks down foodstuffs. Some old-school cucumber pickles are both fermented and pickles, but not all. Another sidenote: Pickling can produce both self-stable pickles and pickles that need refrigeration to keep from spoiling-so-called “refrigerator pickles.” I prefer refrigerator pickles because they’re very easy to make and the resulting veg stays crisp. To start out this season, I made pepper pickled radishes. These are radishes pickled in a vinegar-salt-sugar brine with peppercorns. They turn a light shade of pink as the color leaches out of the radish into the brine. For a new twist this year, I added a sliced onion. In retrospect, I used too much onion, so these are more pepper pickled onions with some radishes thrown into give it a pink color. As they hang out in the fridge, the pepper flavor gets stronger while the vinegar mellows. Heat the vinegar, salt and sugar to almost boiling. Taste it and adjust salt and sugar to your preference. Thinly slice the radishes and the onion on the mandoline. In a pot of boiling water, sterilize a clean canning jar, ring and lid for 10 minutes. 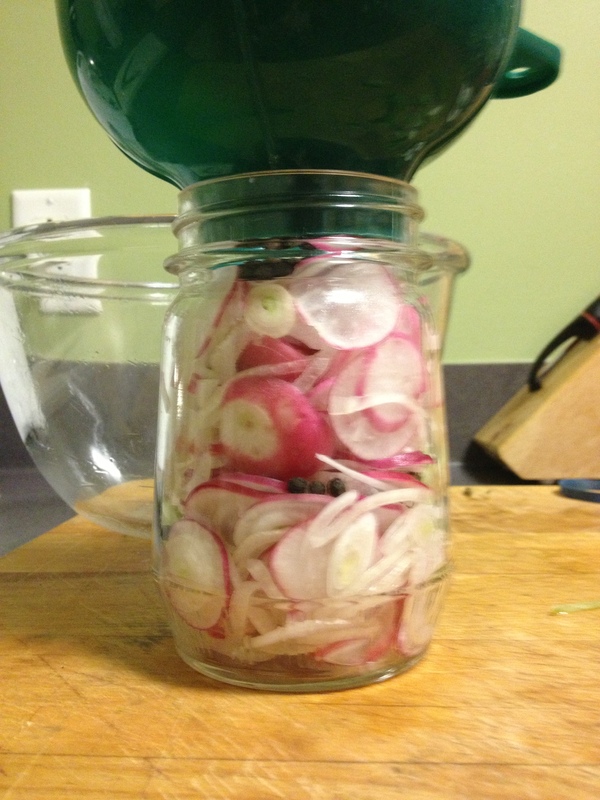 Fill the sterile, hot jar with layers of radish slices, onion slices and peppercorns. Press firmly to pack the jar very tight. Pour over the hot brine until within 1/2″ of the rim of the jar. Tap the jar firmly on the counter to release air bubbles. If air bubbles are still visible, jam a butter knife down the veg to release the air bubbles. Press down any veg sticking up out of the jar, so it won’t touch the jar lid. Top off the jar with extra brine to reach within 1/4″ of the rim of the jar. Wipe the lip of the jar clean, top with the lid and screw on the ring to hand-tight. Put the jar in the way back of the fridge. Let cool for at least 24 hours. Categories: Cooking, Putting Food By | Tags: onions, peppercorns, pickles, pickling, radish, recipe | Permalink. One of my favorite recipes of yours. Glad to have it now. FYI: I’m waffling on the success of the onion in the PPRs… It’s becoming stronger over time instead of weaker and starting to dominate the flavor of the radishes. Ever tried liquor pickling? It’s funnier to say than liquor-infused vegetables. I make bounce, but I’ve been reading about vodka-pickled vegetables, or boozy pickles. Whada think?